When choosing the best backpacks for diaper bags, we looked for backpacks that look good and function well for busy parents! Do you want a bag that doesn’t scream, “I’m carrying a cutesy baby bag” to others? Do you need something that can store everything for a weekend at grandma’s house? We found plenty of options to suit all your needs! Before we get into the reviews, here are a few things to consider before buying a backpack diaper bag. Insulated: If you plan to carry extra bottles for your baby, insulated pockets are great to keep bottles either warm or cool for long periods of time. You can also use them to carry cold snacks, water bottles, or juice boxes! Size: Smaller backpack diaper bags are great to take on short trips, like shopping or a quick trip to the park. Larger bags can hold everything your baby needs for a weekend trip with the grandparents, or as an airplane carry-on! Color: The bags we reviewed come in a wide variety of colors! You can find a nice, neutral black bag for dad that doesn’t scream, “diaper bag.” There are also fun, on-trend colors and prints like bright red, pink, or chevron! Changing Mat: Many of the bags we reviewed come with their own waterproof changing mat, which is nice for changing diapers outside, in the car, or wherever! Other bags have a separate compartment to add your own mat with room to spare! Water Resistant: Carrying a diaper bag means carrying lots of liquids, from milk to juice, water, lotions, and more! A water-resistant bag will hold up to spills without staining. Just wipe off your bag with a baby wipe and off you go! Warranty: Investing in a high quality diaper bag backpack means you can use it for years to come! A warranty will protect you in case something happens to your bag, and is a sign that the company stands by their product! Now that you know what you’ll need for you and your little one, let’s get into the diaper bag backpack reviews! We found 10 great options for parents who want to carry a little or a lot that will also work within your budget! Short on time? What parent isn’t?! We started our review with our Top Pick and Budget Pick, so start there and come back when you have a little more time to look around! Let’s get started! Our top pick for the best backpack diaper bag goes to this heavy-duty carryall from Bag Nation! This bag has a whopping 14 different pockets and compartments to carry everything you could possibly need while out with your baby! There is an insulated bottle pocket to keep your baby’s milk at the ready, along with a pocket with a hole on the side for immediate access to tissues or wipes! A must for messy babies! We also like that it comes with a foldable waterproof changing pad for emergencies, and it includes a small “sundries” bag to keep smaller items like ointments, utensils, and little toys from falling to the bottom of the bag. It’s also an incredibly durable bag with padded straps and extra stroller straps for added comfort and convenience. This bag comes with a lifetime warranty, which is a great assurance! You should be able to use this diaper bag throughout raising all of your little ones! 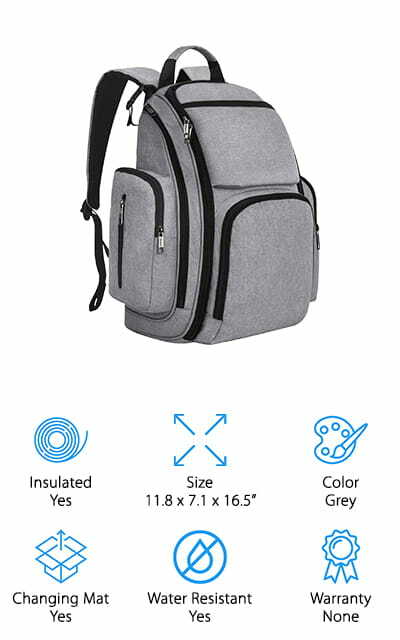 If you’re looking for the best cheap diaper bag backpack, this roomy bag from HaloVa has a lot to offer parents on a budget! Even though this is an inexpensive bag, it doesn’t look like it at all! The oxford fabric is water-resistant and easy to clean, just like other expensive bags! This bag is split into two compartments: a lower, insulated compartment that opens in the back to store formula and food, and an upper compartment with pockets for bottles, clothing, toys, and more! There is also an insulated front pocket to store up to 3 bottles securely. We also like that it has a side pocket for tissues and wipes, making accidents a breeze to clean up! Finally, they come in 11 different on-trend colors that both moms and dad would be happy to carry around, including the light coral orange one we reviewed, navy, grey, and a bright red one that would look great with any outfit! Next up is one of our favorite compact-sized diaper bag backpacks from Cateep. 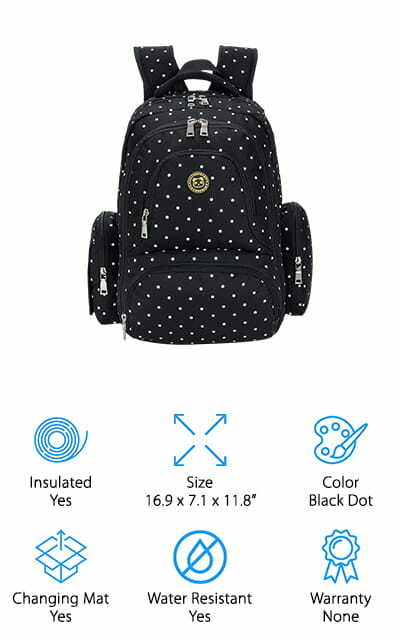 This polka-dotted backpack can pack in plenty of supplies in a sleek design that won’t feel or look bulky. The main compartment is roomy enough for clothes, diapers, and even has a padded compartment for a 15” laptop. We like that the front compartment has 3 insulated bottle holders, utensil holders, and a mesh pocket to keep towels dry. There is one insulated side pocket for a small bottle or cold snacks, and another that’s made for tissues or wipes for easy cleanup! 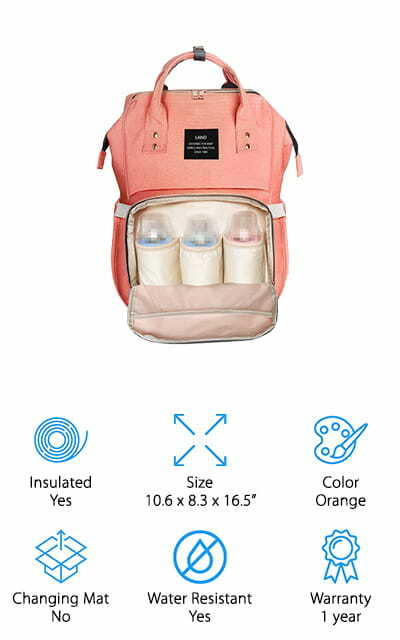 We also like that it comes with all the accessories you need to spend a stress-free day with baby: a waterproof changing pad, stroller straps, and an extra insulated bag for bottles or to keep your own water bottle cold! If you’re looking for a diaper bag that doesn’t look like one, definitely consider picking up one of these bags for your next adventure! 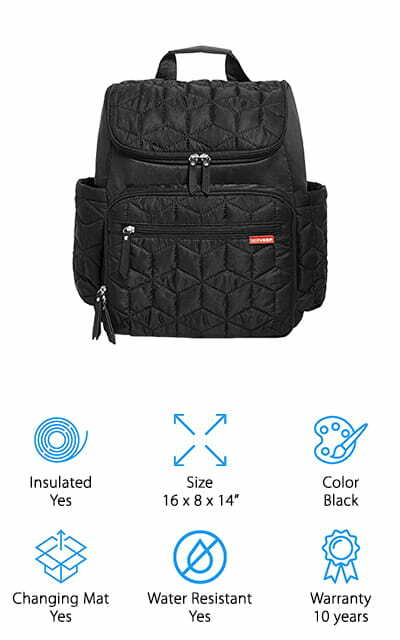 This spacious, quilted bag is one of our favorites for the best diaper bag backpack to take on your next trip or a weekend sleepover with grandma! We like that this quilted bag is not only large, but it’s also easy to access everything you need! It comes with 2 insulated side pockets and a changing pad pocket that doubles as a laptop holder. It also comes with 2 storage cubes: one insulated cube that holds 2 bottles, and one mesh cube to wrangle small toys, toiletries, burp cloths, or extra diapers! It even comes with a cushioned changing pad for diaper duty on the go! The stroller straps make it easy to attach to your stroller, giving your back a break! This bag is so large that you could fit everything your baby needs overnight. It also doesn’t look like a diaper bag, so you could repurpose it as a carry-on bag for you once your baby outgrows it! 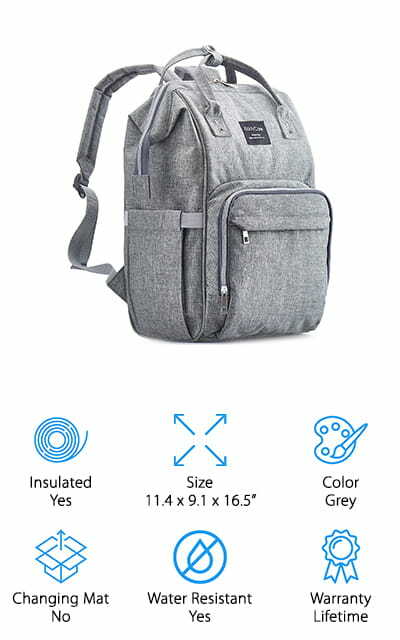 If you are looking for the perfect Father’s Day gift, consider picking up one of these diaper bag backpacks from CoolBELL. 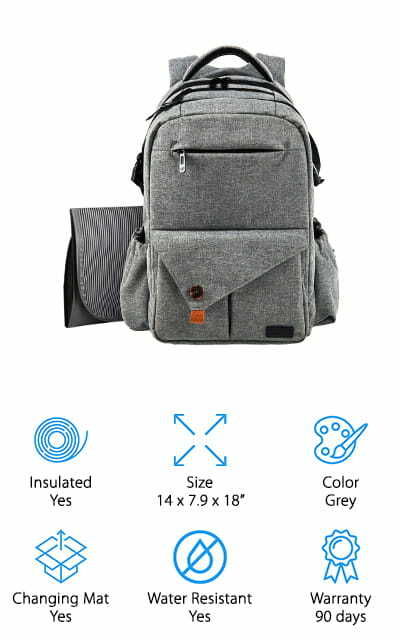 It looks just like a typical backpack you would see around the office, with a sleek design and masculine-friendly cool grey fabric. In addition to looking cool, it also packs a serious amount of stuff inside to keep your baby happy all day long! The main compartment is huge and can carry formula, clothes, diapers, and more. We like the insulated side pocket and an insulated bottle sleeve to keep your baby’s milk at the right temperature. There is another side pocket that’s perfect for tissues or wipes, with a slot on the side and flap to keep everything dust free. The front pocket holds up to 3 bottles and has a mesh sleeve for carrying extra dry towels or diapers. With all this space, you can easily throw in a small snack or water bottle for yourself, too! 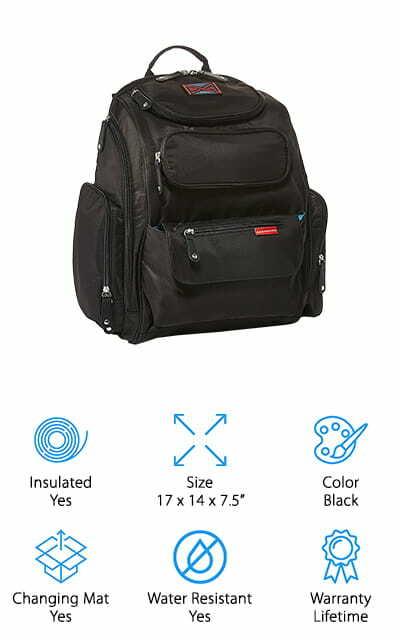 Another great option for a diaper bag backpack for dad comes to us from Mancro! This bag comes in a dark grey or black, and it has the same sleek, professional look of a work or travel bag. The front flap unzips all the way to the bottom, giving you immediate access to everything in the main compartment. The main area is also very large, with several pockets to fit small toys, the changing pad, a tablet, diapers, clothes, and much more! We also like that there are several pouches for bottles, including 4 non-insulated pockets for empty bottles and 4 insulated pockets to keep milk warm or cool for hours. There are also 2 outer pockets on the side, one of which is made with a zippered side slot to fit tissues or wipes. The padded back and adjustable straps make it easy to carry everything without straining your back or shoulders – a must for busy moms and dads! Looking for the best backpack for diaper bag use that keeps every little thing in its place? Check out this backpack from HapTim! It has a whopping 18 different pockets, so there is a designated place for everything. This means you can easily find and grab whatever you need in a hurry! There are 3 insulated pockets for bottles, and separate pockets for things like your tablet, clothes, keys, a pen, changing pad, snacks, tissues, and much more! We also like that there is a theft-proof pocket on the back to keep your wallet and phone safe from pickpockets. It also comes with a changing pad for diaper duty on the go, which fits easily into its own pocket in your backpack! There are also stroller straps that keep your backpack latched securely to the stroller, giving your back a break! This backpack has so much storage potential that it would make a great bag for weekend sleepovers at grandma’s! 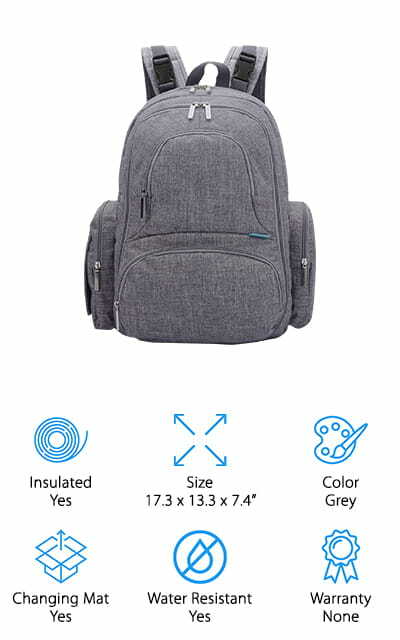 If you prefer a bucket-style backpack that doesn’t look like a diaper bag, check out this on-trend backpack from KiddyCare! This bag packs a lot of stuff, with 15 pockets to keep everything in its place. There are 3 insulated pockets for bottles, a side pocket for wipes, and a waterproof pocket for storing wet clothes or keeping your phone dry and protected! We like that this bag opens wide from the top, giving you access to several pouches and pockets. There is also a zippered opening in the back that lets you grab things like extra clothes or diapers from the bottom of the bag without having to dig through everything! The design of the bag is also a major plus! Its simple design looks good with any outfit, and the chambray fabric is both trendy and easy to keep clean. There are also handles to carry it from the top or strap to your stroller for more options. One thing we looked for in our search for the best diaper bag for sale was if the bag could grow with you beyond the baby years. We think this bag not only makes a great diaper bag, but it could easily transition to a carry-on bag or workbag after your baby has grown up! The style of the bag is simple enough to look like any other backpack and has several compartments to keep everything in place. There are 3 insulated bottle pockets in the front and a water bottle pouch on the side to carry your own drink! We also like that this backpack has tons of space to store clothes, diapers, towels, and more. To get to the stuff on the bottom, there is a flap on the back to access the bottom of the bag. It also has a waterproof pouch on the back flap and a theft-proof pocket to keep your phone and wallet safe! 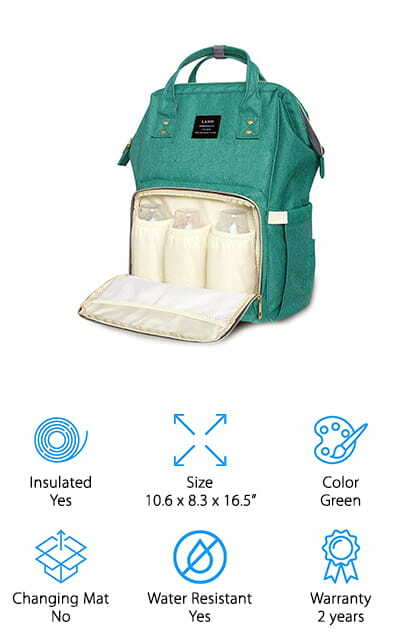 The final review in our diaper bag backpack buying guide is this adorable green bag that both mom and dad will love to carry! We like that this bag is small and lightweight, making it perfect for an afternoon at the park or shopping at the grocery store. Though it is a small bag, it can pack in a ton of stuff! The bucket-style opening at the top opens super wide, giving you access to everything you need right away. There are several pockets in the main compartment to wrangle extra bottles, toys, and a changing pad. We also like the easy-access opening on the back to grab things from the bottom. The 3 insulated bottle pouches keep your baby’s milk at the right temperature, which is nice for long trips out! We like the style of this bag, too! 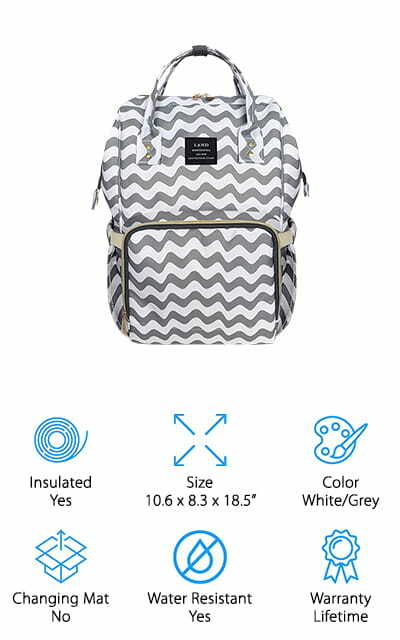 After your baby outgrows a diaper bag, this could easily transition to a carry-on bag or hiking backpack for you!